Every month we feature a Club Member's aircraft of the month. We showcase the builder, flyer, or collector and the interesting aspects of their aircraft. If you have an interesting project, or know someone who does, please send nominations! We vote on the nominations at the monthly club meeting. “It is scratch built . I made the molds for the fuse and inlet duct. It uses foam core wings and stabs and has 9 servos. Powered by an HET motor and an 80mm Jett Fan with 6S 5800 mAh batteries. Eric Brubaker laser cut the plywood for the short kits that I have been selling.” Congratulations, Rodger, that is a beautiful jet! Powell built this kit for flying indoors. With nostalgic lines, it pays tribute to the antique style of free flight models of yesteryear. The laser cut kit builds straight and true, and uses parkzone ultra micro flight hardware. 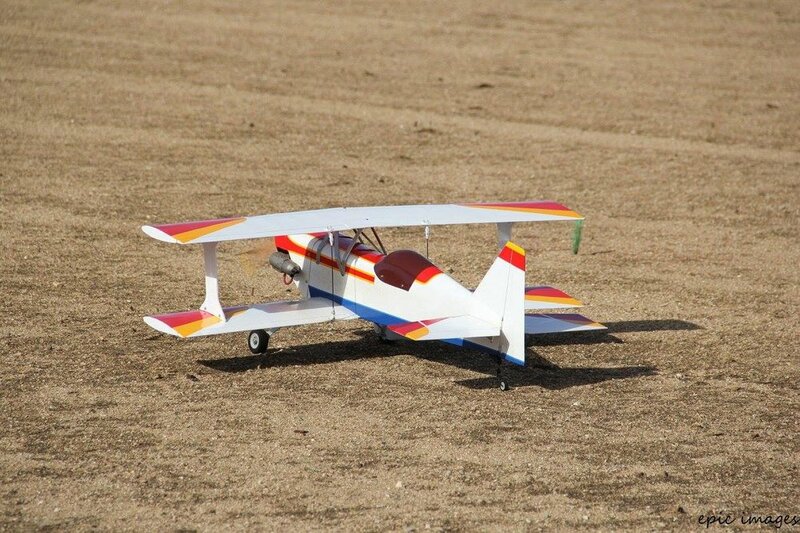 Rudder and elevator only make this a sporty model to fly in the Aspen Builders Gym in Tehachapi. Great job, Powell. The covering job alone is impressive! It is 1:3.85 scale built off of 3 view drawings. 144" long 85" wingspan. 45lbs. Powered by 2, 120mm turbax fans, 6kw per fan on 12s 8000 per fan. Built from blue foam, pink foam fiberglass and carbon fiber. Has 63 flights...140mph top speed. Took about a year and a half to build. Was built in 2012. It's a Pat Tritle design, released as a kit by Brodak in 2016. Myself and others pestered Pat for a Connie starting way back in 2012, and he final delivered. Anyhow, it's 60" span and built mostly of 1/8" and 3/32" sticks and laser cut shapes. Power is from four Suppo 2212 motors driving 8x6 slow flyer props. Current draw should be no more than 10 amps per motor, and adequate power can be provided by a 3S 2200mah LiPo. I expect a finished weight of about 3 lbs, giving a wing loading of about 18 oz/ft^2 and a power loading of 110 watts/lb. For a short period in 2000-2001, my family lived in Kansas City, Missouri. One of the good things to come of living there was a visit to the Save-A-Connie museum at KMKC. It was at that time I developed a love of Constellations, and have been pining to have an RC version ever since. It would be sacrilege to do anything but a classic TWA scheme, so that is what I will do. It has no spar caps, so flying will only be in a smooth scale like manner. This is Weston's biggest plane yet and he's having fun with it already. It's got optional leading edge slats that help with the STOL style of flying. Weston enjoys the articulating landing gear with tundra tires too. All in all, this is a stable, easy to fly bird. Weston enjoys it a lot! 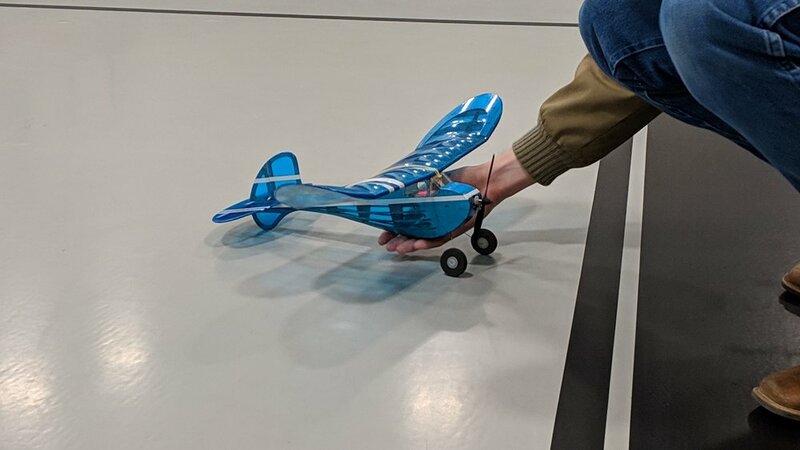 A "simple plastic airplane design", Eli brings us the concept that almost anything can be turned into a model airplane. 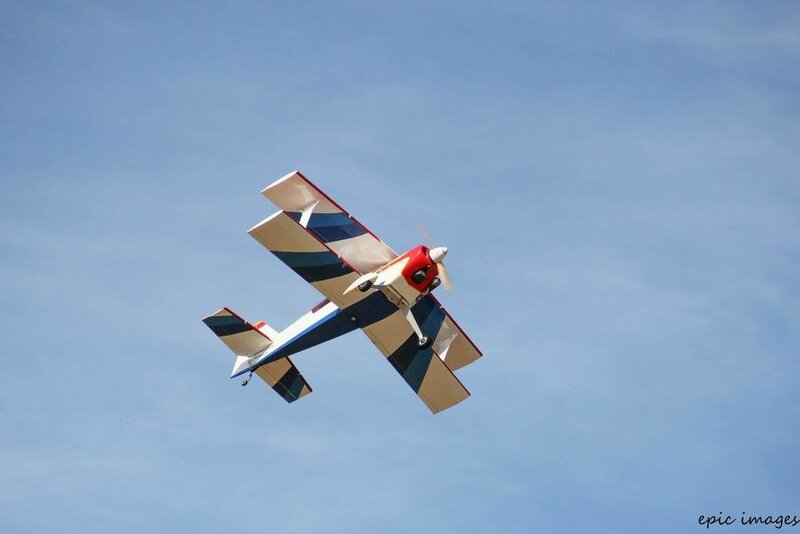 Composed of a few household items such as a yardstick and sliding door channel, this Evolution-powered airplane rips through the sky with ease. Inverted, right side up.... whatever, this airplane is a great fun flyer. Eli's comments coming soon! I ordered the plans for this project in September of 2011.It finally flew this past August or so. I started the build and ended up waiting for the gear to be designed and developed for over a year. I also had a custom live exhaust fabricated to fit my engine choice. I tried my hand at cowl flaps for the first time and fried a few servos in the process. I had a bunch of help from Eric Brubaker with the gear doors that he hand formed from some aluminum flashing and he helped me fix a mistake I made on the canopy frame I made on one build day. He also drew the tail fork in CAD which I printed on my 3D printer. I later had it printed from stainless and bronze by Shape-ways. Brian Min drew the gunsight in CAD for me, I also printed that on my 3D printer. Both of those guy’s were a huge help getting this project finished. The hardest part was getting the wing fillets correct. The panel lines were all laid out with chart-oak tape and primed. The rivets were all burned in to the primer one at a time with a sharpened 1/8” brass tube inserted into a soldering iron. Always best to have one and a half beers prior to this process. (I did a study). The airplane is 1/5 scale. 94" wingspan 35 lbs. Power is from a Zenoah GT-80. It is all built up balsa and lite-ply. I used Jerry Bates plans. The N1K2-Ja was only produced in small quantities during the closing months of 1945. It was a culmination of most of the lessons learned fighting the US during the Pacific Campaign. It had armor protection for the pilot and self sealing fuel tanks. From what I have read about the plane it could hold it’s own against the Hellcat and Corsair but still had a lot of trouble with the Mustangs. My model is an attempt to replicate an aircraft of the 343 Kokutai, Japans squadron of Aces. 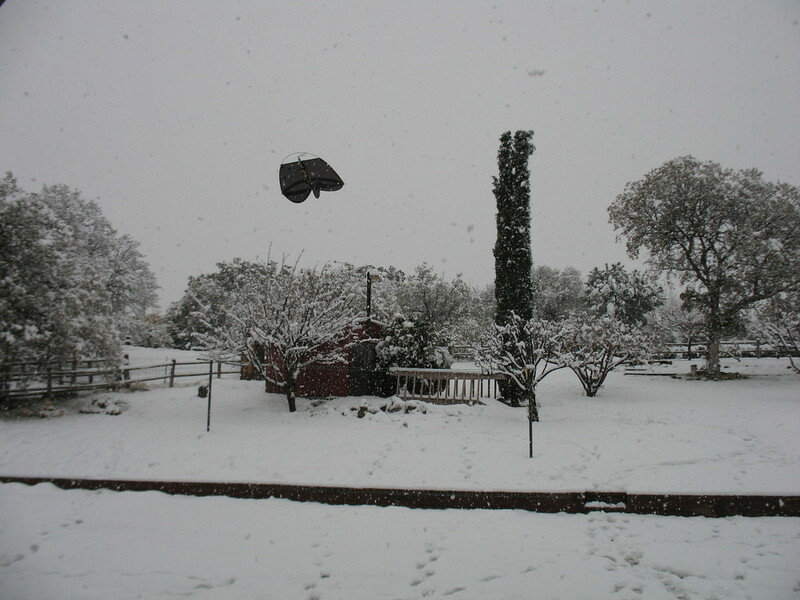 It flies great, like a big heavy Amana freezer from the 50’s. I was attracted to the proportions and wide track landing gear. It has nine flights and I am ready to add the final details. This is an old Multiplex Fun Cub, one of the funnest, easiest to fly super cubs out there. Because I like to rough it up all the time, I ended up with a broken landing gear, and a perfectly new set of floats. So, the floats went on right away. Brite Lake is a great place to fly floatplanes. This one also has a full complement of led strip lights facing inward into the thick of the foam structure. The effect is a fully-illuminated airplane that's easier to maintain orientation that during a brightly-sunlit day. Must have the landing lights too. It's fun to fly from glass smooth water. I won this kit off eBay a couple years ago for 35 bucks! It had a few missing parts but was able to make them. I did a few years extra modifications it has a hatch to access fuel tank, landing gear moved forward 1/2-inch for better handling, dual-aileron servos sunk into the wings in custom made hatches. It is powered by a .15 gas evolution engine, JR servos, and LiFE batteries. It is a fun break from flying highly aerobatic planes, an old style barnstormer kind of flying. Jake Wyatt's Cessna 150B - N7327X - A Full-scale Airplane! Congratulations to Jake Wyatt for earning his Private Pilot License in a Cessna 150B, N7327X. A locally available rental aircraft, this is the bread and butter of flight trainers. Congratulations, Jake! "I put 54 hours in this plane in order to get my Private Pilots license. I fulfilled all the requirements in this plane including my solo, my cross-countries and my check ride, and a lot of basic maneuver training( Stalls, steep turns, slow flight, emergency descents, engine failure practice, S Turns, rectangular pattern, and turns around a point). Also Bri and I did our first trip in this plane after i got my license to Oceano for a weekend." "It's a Supermarine Spitfire Mk XVIe in 1:5.33 scale. The full scale is powered by the Packard Merlin engine which was manufactured in the US." composite fuselage, wood wing and empennage, all scratch built. Congratulations to Mike Wilms for plane of the month. Mike built and flew a Wings Maker Ultimate 40, and it is said to be a great flying airplane. Sporting a 42-inch wingspan, this hot biplane is known to be a solid aerobatic platform, yet have docile landing characteristics. We're looking forward to seeing it fly a lot this year! Congrats, Mike! Brent knocks it out of the park once again. 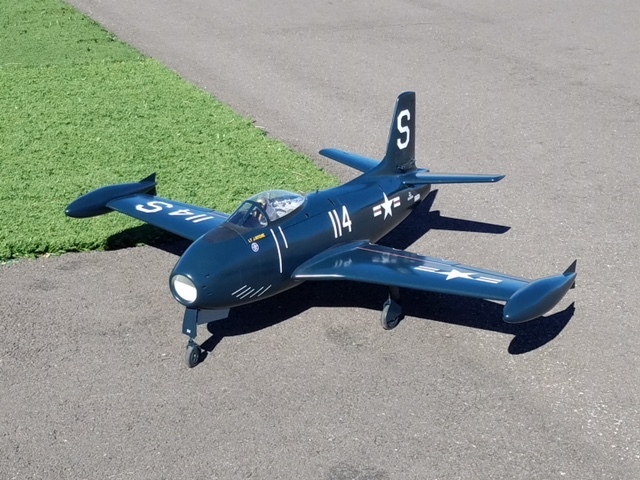 This F8F Bearcat flies like it's on rails, and it sounds great. ESM's all-composite kit was re-painted in a more scale-correct color by Brent. Powered by an XYZ-53 twin-cylinder motor and swinging a 21x10 prop, this airplane lifts off with authority. Slow rolls are truly on the thrust line and the realistic gear retraction timing makes this thing a pro-build. The retracts are pneumatic and canopy is custom-molded. Also, Brent made the gear more narrow to bring it back to a scale-like stance. At 71" wingspan, this airplane weighs in at only 20 lbs. Great job, Brent! We want the drop tank, next! Who knows how this airplane started life? It was rescued from a dumpster, sold to Kyle for a penny, and now it's living it's second life with a new covering scheme and radical flying. The once "ketchup & mustard" covering was swapped for a race-driven orange on black and now Kyle flies knife edge passes with ease. Check out Kyle's Plane of the Month! It's a Great Planes Super Stearman. Zenoah G-26 with a 16x8 Xoar prop. Spektrum DX-18. The pilot bust was provided in the kit but he looked like he was sitting through a really slow sermon. Grace got out her paints and did a number on him. Noted characteristics are that it's a great slow-flyer and has scale-like mannerisms. 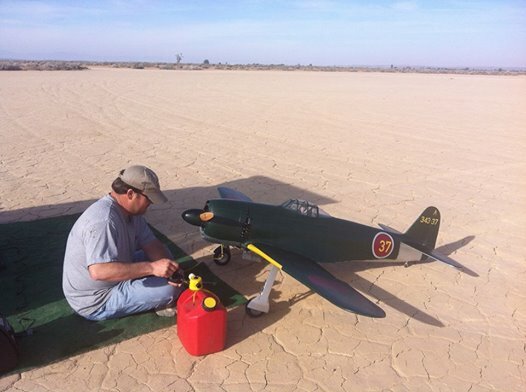 Congratulations to Neil Browning, the clubs newest member, and already plane of the month! This month we bring you Neil's Kadet, he's enjoying flying until he's got it dialed in and comfortable flying it on his own. Nothing like a great flying trainer, no matter how advanced a flyer you are, a good airplane is always fun! Neil, welcome to the club, we look forward to many years of watching you fly. We also look forward to many years of watching this Kadet! That's long-time club officer and club co-founder Wayne helping him out with the controls. This is what the Tehachapi Crosswinds club is all about, folks. Just pure flying fun! Welcome, Neil, it's so great to have you! "When I added a 700 class machine to my fleet, I decided it was time to turn my Raptor into a night ship. 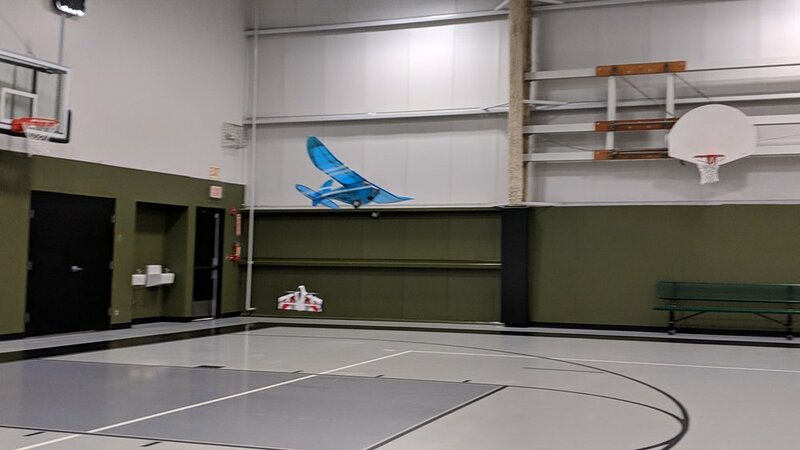 With the summer months coming up, and our club having regular night fly events, it seemed like a perfect fit. The Raptor is actually a bit easier to fly at night than in the day. The lights really help with maintaining orientation. The rotor disc lights up! With the added weight of the light systems, the engine was switched out from an OS50SX-H to a YS56SR. The YS has more than enough power, and the heli flies even better than before the lights!" 11 degrees of cyclic pitch. Ungoverned head speed in Normal mode. VP Power Master 30% nitro, 23% oil. 2S 2000mah LiPo rx pack with 2 redundant 10A Castle BEC's. Flybarless conversion with Align 600 rotor-head. DS655 servos for rudder and throttle. YS56SR with OS 55 Powerboost pipe. 8.5:1 gear ratio. Various aluminum and CF upgrades. Switch 95mm night tail blades powered by hearing aid batteries. Generic 12v LED strips of various colors wrapping the canopy, boom, and tail fin. 2S 850mah LiPo powering the LED strips. Congratulations to the winners of the Indoor Free Flight contest held in Mojave on April 15, 2016. The contest includes building from a kit your choice of two free flight models. This year, it was the Super Delta Dart or the Peck Polymers R.O.G. Kit. Those that built the R.O.G kit had the option of performing a from the ground takeoff, thus rising off the ground, which gave them a 10 sec bonus. For the volunteers efforts and time, for those that attended with enthusiasm and excitement, the indoor event was a fantastic evening held by all. Thanks to everyone! 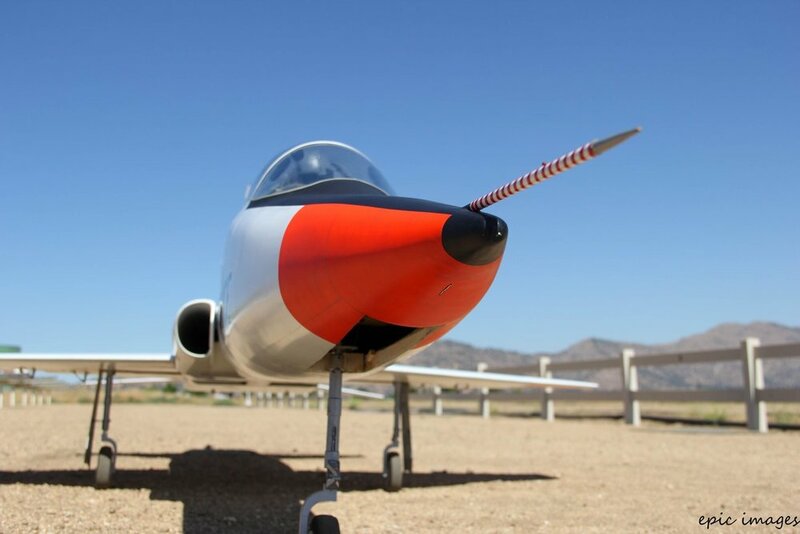 And, congratulations, winners, you have made the Tehachapi Crosswinds RC Club Plane of the Month! This is Tyler Reed's Millennium Master from Tower Hobbies. It is a "receiver ready " plane. 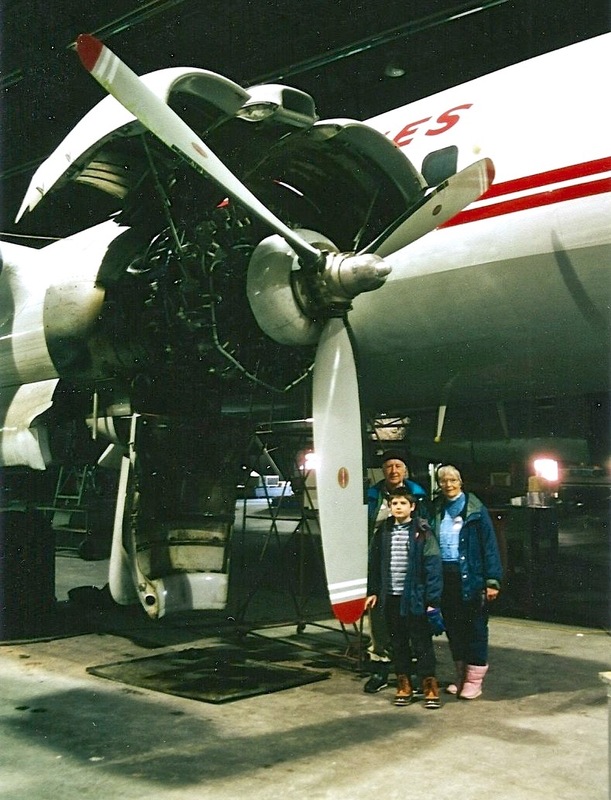 Tyler is 9 years old and bought the plane with his own money. He took off and landed it from the very first time he flew it a few months back. Tyler added a #9 to the wing to represent his racing number for his dirt bike. He enjoys flying his plane when it's not too windy and when he's not busy riding his dirt bike or doing bmx! Dave says it's a nice flying airplane, even in the wind. It's super easy to land, but sure would be nice with retracts! Nice going, Dave. As usual, you're throwing around a classic bird that seems to be magnetically attracted to the sky! This Seagull Models Ultimate is a 90-size, 55" span hot rod. Matt rebuilt this will all new hardware from Miracle and Dubro. It's got a DLE 20cc turning a 16x8 prop. Hitec Digital servos in all corners, this model is aerobatic too. Matt would like to thank Rick Landry, Bill Fisher, and his family for helping him complete this project. Photo courtesy Epic Images. Matt is the Vice President of the club and is proud of the work he's put into the flying field and his airplanes. Tehachapi Crosswinds thanks you, Matt, for the hard work. We enjoy it every time we fly! My Christen Eagle is a true locally-sourced project. The kit came from TNR Hobbies in Mojave, during their "Going-out-of-Business" sale. I horse-traded with Matt Reed to acquire Bill Fisher's old YS 140L four-stroke engine. 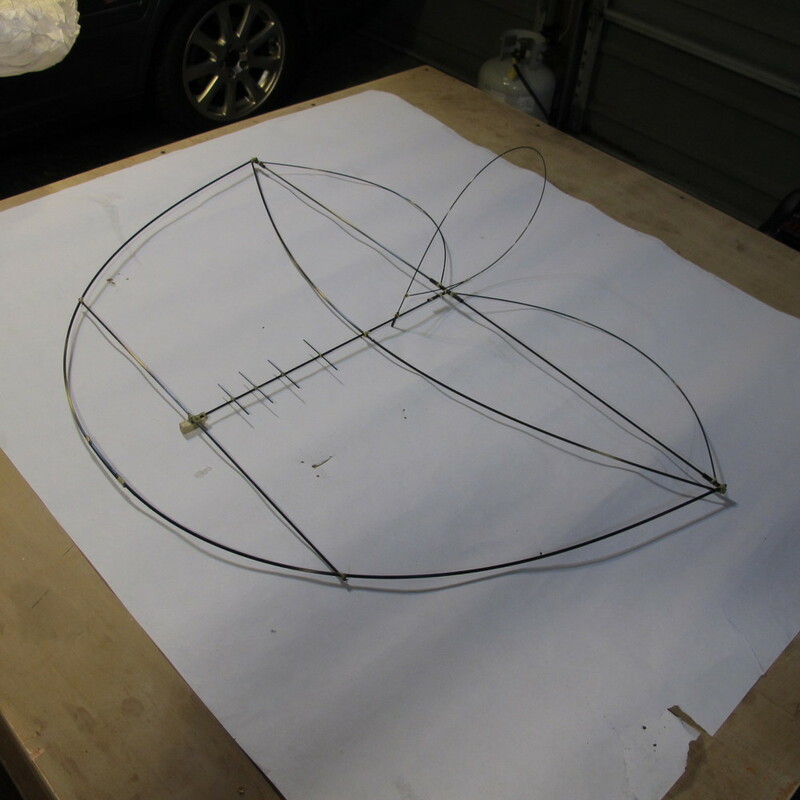 Dave Metz provided many helpful suggestions for completion and setup of the airframe. Eric Brubaker and Cooper Parrish helped pit crew and preflight before the maiden. I spent most of the early summer cleaning up and tuning the engine, finally getting it dialed in on the bench during our 4th of July fly-in. The airplane was built over the summer while Jessica and Maddie visited family in Kansas, leaving the dining room table free for the build! This was my first glow-powered ARF build in many years. It's a Hangar 9 kit with Hitec servos and a FrSky 9-channel receiver. The maiden flight was a success and I'm looking forward to getting familiar with the model. Between his being the club treasurer and a proud dad/grandpa, John builds some seriously nice planes. This time, he has produced from plans the original Ugly Stick, serrated trailing edges included! Using the latest in laser cutting technology to cut the parts, John built this plane the old fashioned way, sticks and glue. The covering is his own design. Very nice airplane, John! Special thanks goes to Brubaker Models for the laser cutting! Wayne is never one to let a lack of parts keep him from flying. In an innovative move, he installed a handy Folgers coffee container to the nose and fashioned what has to be one of the best cowlings ever seen. Congratulations on being Plane of the Month, Wayne. Our members love to see what you'll do next. Keepin' it fresh.... That's Wayne! Past club president Bill Fisher recently debuted his version of the Twist 60. Changed from a glow airplane to a hot electric, the Twist 60 re-flight was described by Mr. Fisher as "exciting!" It's got all the power one would ever want and is packed with some choice hardware. 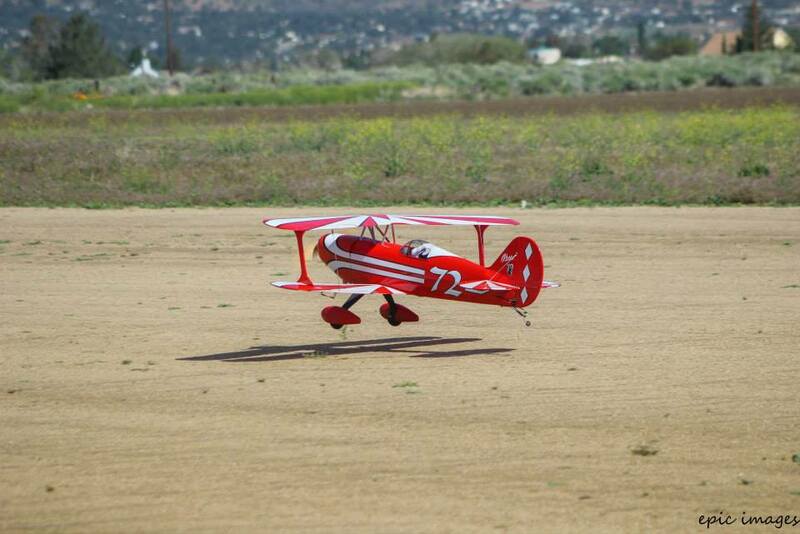 Mr. Fisher is one of the founding members of Tehachapi Crosswinds RC Club, and consistently builds great models. The Twist 60 is yet another example of his affinity for electric flight. Great job, Bill, we look forward to seeing many "exciting" flights this summer and for years to come. Landing gear moved from wing to fuselage. Going to change it back to the wing with some heavier wire gear. After a few modifications, Jake's ARF Stearman demonstrates very un-scale-like vertical performance and very spontaneous maneuverability. Of course, he flies it with full authority and control. 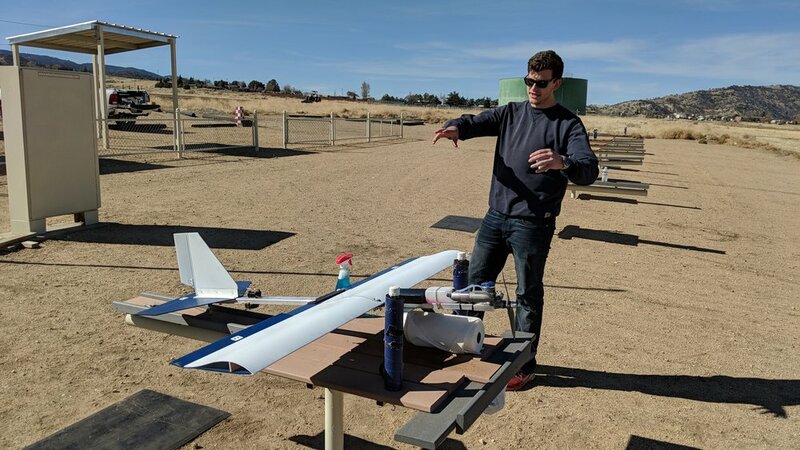 Jake installed a larger brushless motor and ESC than called for and now he can master the winds, and especially crosswinds, that our field sometimes offers. Ever seen a Stearman with full vertical climb performance? Me either. This one will go and go. Next time you're at the field flying with Jake, take notice of Jake's landing techniques. He has excellent energy management and wind direction awareness all the way through to touchdown. It's the kind of flying that takes some of us years to learn. Jake, Tehachapi Crosswinds is really enjoying watching you fly, keep it up! Rob Heap's Flite Test "Kraken"
“Shortly after moving from Kansas to Mojave and finding the Crosswinds club last spring, I got bit hard by the R/C bug again. I had sold almost all of my fleet and equipment before moving and what was left was buried deep in our mountain of boxes. In our temporary housing, I had limited space to work with and a tight budget. My wife and daughter were still in Kansas so I had lots of time to experiment with new construction materials and methods. I’d been following FliteTest on youtube for for a while and when they released the plans for the Kraken, I had to build it! After all, who isn’t be excited about a 6-foot twin-engined flying wing made from $9 of raw material. With inexpensive power systems and servos from HobbyKing I was able to have the whole aircraft in the air for under $70! If you want a quick weekend project to use spare electronics you may have laying around, I highly recommend looking through the free plans on the FliteTest website. 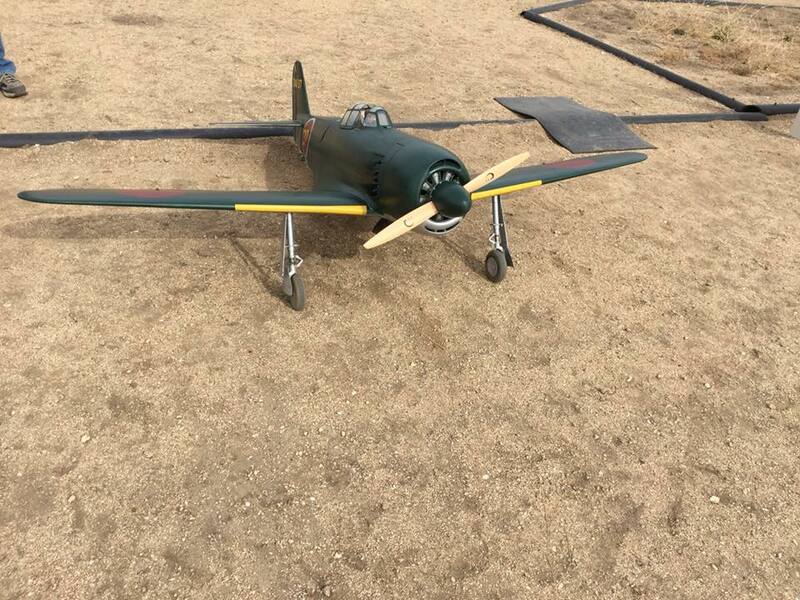 Construction is fast and very easy and while the materials used are not extremely durable, the airplanes will give months of hard flying fun - and when they crash or need replacement it’s very easy to just build another one. The idea of night flying at the July 4th fly-in inspired me to fill the inside of the wing with 12-Volt LED strips from Ebay. They shine through the white foam board and light up the whole wing without being too bright to look at directly. I used red and white along the leading edges for orientation and white aft of the spar for visibility. The only construction change I made to enhance the lighting was to make the spar from black foam board to help separate the colored leading edges from the white trailing edges. The airplane is very docile in the air and can be slowed to a walking pace. It flies inverted well and is more nimble than you’d expect for its size. I have the two electric motors mixed through my radio to provide differential thrust, which can produce a wild flat spin - not something you typically see from a flying wing. Many years ago, Cliff built this airplane from a kit, meticulous and proud. It has been a work in progress since, small details being completed as products come available and time permits. To set this plane apart from all the rest, Sharon took over the finish work. She did the covering, stitchwork on the cockpit coaming, and pinked tapes on all the surfaces. 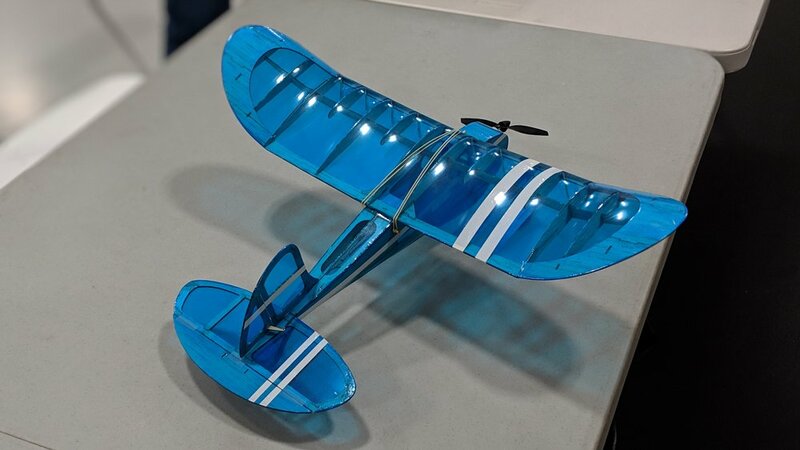 The covering and finish of this airplane was so regarded by the local hobby shop, they asked Sharon to take over covering airplanes for their business. In her characteristic way, she replied, as she tells it, "not on your life." The airplane is just about ready for first flight after all these years, just a few engine tweaking details remain. Unfortunately, Cliff & Sharon have announced their departure from the club for the bluer skies of Arizona. Tehachapi Crosswinds wishes them a fond farewell. Cliff & Sharon, may your next club enjoy many flights of the Spacewalker and the kids that are watching not have multi-colored hair. Bri's Tower Hobbies "Razor 3d"
"Safety Dave & Bri" stenciled on the side of this ARF, this project involves more than an ARF. This airplane represents the community values of our club. Originally finished by Dave Metz, Bri flies this airplane with authority, while enjoying the social value of being in a friendly, supportive club. It's always enjoyable to see how much control this pilot exhibits in her flying. Standing watch, her dad, Eric, provides a quiet confidence as Bri hones her skills at the sticks. 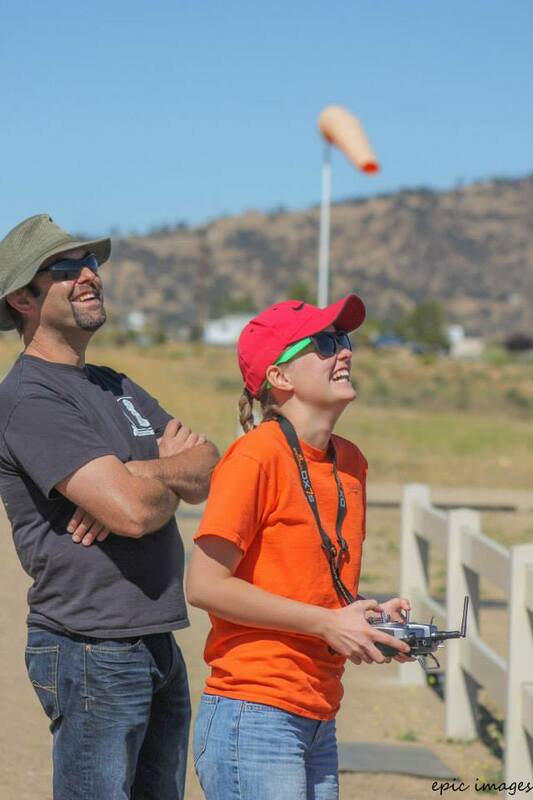 Bri, Tehachapi Crosswinds is proud of the RC pilot you've become! Many happy landings to you! Originally built by club member Dave Metz, this little beauty was finished by Weston's dad with the intent of using as a trainer. It's built from a Prelude 20 wing and "Number 7" plans. It has travelled the country, moving with Dave from the south to the west. Weston is incredibly excited about flying it. In fact, he's spent some time on the buddy box with his dad, learning the basics of turning and leveling out. It's a balsa build with sheeted wing and aluminum gear. Originally, the airplane was built for a glow engine, but using a 3D printer, it was converted to an electric. The motor mount was printed in ABS plastic and includes the proper down-thrust and right-thrust angles, yet bolts into the same mounts as the glow engine. As an electric, it is lively when needed and docile when throttled back. Hitec digital servos and Diamond-tread wheels round this build out. One day, Weston will be flying this airplane by himself, most assuredly with a proud dad watching from the pits. After weeks of crowded building in his room, Jake Wyatt has built a great flying Goldberg Tiger 2. He truly put in effort and patience to build a kit, something that makes Jake stand out in the crowd. Tehachapi Crosswinds RC Club congratulates you, Jake, for a job very well done. Stephen and Terri Lucy’s P-47D Thunderbolt. Zirolli design, Robart / Sierra precision landing gear, 3W 85xi engine, Hitec / Futaba radio gear, 37 lbs wet. Tehachapi Crosswinds RC Club is proud of your progress, Kyle. Beautiful job building and flying! It is from Hangar 9 and spans 106". Manual says is will should weigh between 13 and 14 lbs. The engine is a DLE 30cc gas. Calls for a 20 to 26 so it has a little extra kick to it. It has 3 position flaps which take about 4 second to move to each position. I substituted the scale tires for 6" tundra tires. Flies great! Flies very scale-like and is easy to land. First flight of my Hangar 9 1/4 scale Super Cub. All went well. Flies great. First landing deadstick. Only one small bounce. The IFO Mk3 is a great all around airplane. Made of carbon rods, ripstop nylon, and kevlar thread, it's easy to build, very durable, and repairable. 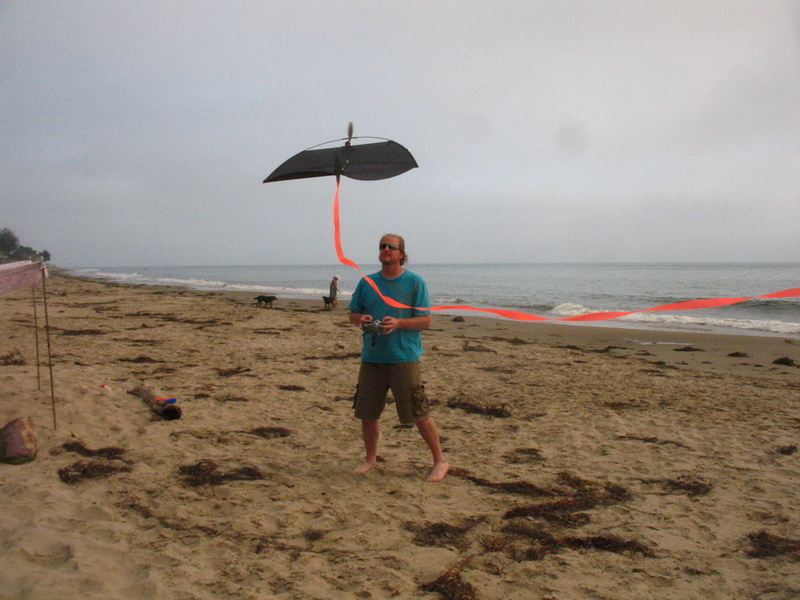 The IFO can be built in a weekend and used for indoor flying as well as outdoors. In the hands of an experienced pilot, it provides satisfying hovers, explosive power to weight, and stable inverted behavior. To the beginner, it's a stable airplane that is durable. And COMBAT machine! I won a couple of championship combats with it, was a lot of fun. Inventor of the IFO, Dan Kreigh (left), and Mason Hutchison (right).